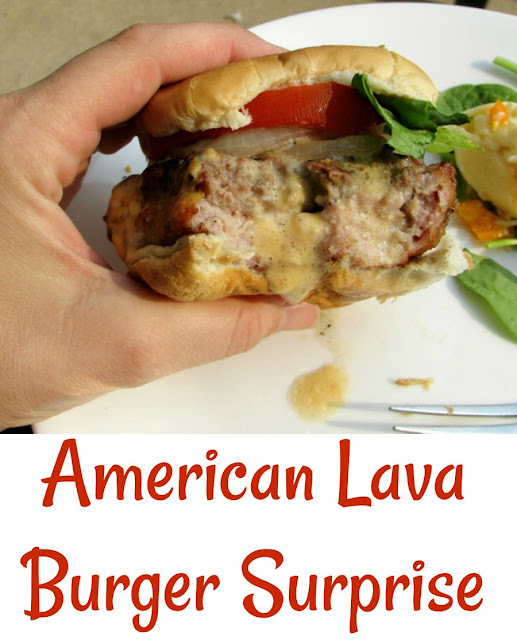 American lava burger surprises are part pork, part burger and stuffed with American cheese for an out of this world burger experience. I wanted to make something fun for our family 4th of July celebration. As I was brainstorming, I was listening to the TV. Food Network was on, of course. Guy's Grocery Games was on but I was too busy searching around Pinterest for ideas to really pay attention. I perked up with I heard the contestant describe his offering to the judges. A hamburger that was a beef patty on one side and a pork patty on the other. He put cheese in the middle. A new version of our favorite hamburger surprises. That's it. I heard Guy call it a Juicy Lucy so I searched and found that Juicy Lucies (or is it Juicy Luci?) are a pub favorite in a variety of locales. Nobody makes it with pork and beef as far as I could tell. So, I made up this version. I'm so glad that I was able to come up with something fun to make for our celebration and also try a new version of hamburger surprises. I've already brainstormed an idea for our next version of hamburger surprises. I can't wait to try it and share it with you. Hey guys, Carlee here. I just wanted to chime in a bit on this post too. These burgers were really flavorful and really giant! Make sure you are plenty hungry before you tackle one. The mix of pork and beef makes it that much more interesting. I didn't see anything quite like it when I was poking around. MiMi gave it the lava burger name because the cheese can erupt out. I read one post about the traditional all beef Juicy Lucy and the pub's tag line about it was "fear the cheese." You really should be careful. Straight off the grill, that molted goodness can be dangerously hot. A few of us learned our lessons the hard way, with hot cheese running down our hands. None of us put them down, but you could tell when somebody got to the cheese! ;-) Ok, now back to MiMi's recipe. She was nice enough to give you guys a few tips too! American cheese melts really hot. Therefore the name "lava." I would suggest cutting it in half (or letting them rest a bit longer than normal) before enjoying so the middle cools a bit. Gently mix the Lawry's into the ground beef and pat into a rectangle on waxed paper. Divide evenly into 4 flat patties that are slightly larger than your hamburger buns. Fold each cheese square into fourths and set on the beef paties. Place the pork patty over the been patty and gently pinch the edges together. Grill as you would a thick hamburger. Yummo! I would need a long run after that though. Thanks for sharing this yummy recipe with us at #WednesdaysWisdom see you next week. Oh my word. These look insane!! I'm intrigued by pork on one and beef on the other. Sounds delicious!! They are pretty crazy! We really enjoyed them. I was perfectly happy to eat one of the leftovers the next day! Yum! Stuffed burgers?? I'm definitely hungry now. Thanks for sharing at Inspiration Thursday! They are the best! Thanks for hosting! This looks absolutely delicious. There is nothing I love better than a burger on a grill. Thanks for linking up on the #HomeMattersParty this week. Hope you will come and I hope you will come back and link up again. I am a fan of most foods, but it really is hard to beat a good burger fresh off the grill. There is just something about it. Thanks for stopping by! Now I'm craving burgers!! My hubby would love these. Thank you for sharing at Merry Monday! These are crazy good! I think it is hard to beat a good burger though. Thanks for stopping by! 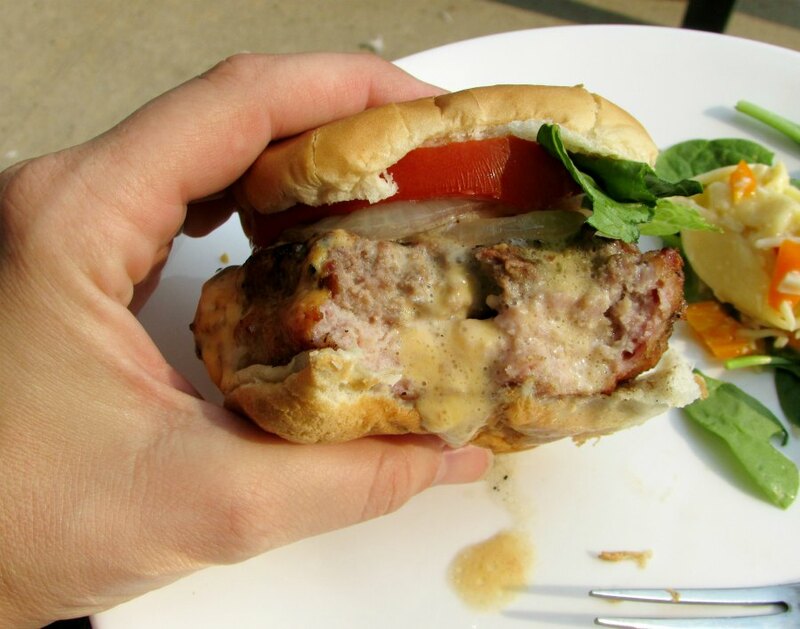 It is quite Juicy Lucy and totally worth making! See you at the party! Wow! I am loving your site. My hubby would die and go to heaven if I made up these patties for him. Definitely pinned. Thank you so much! We really enjoyed these burgers. I hope you do too! I would say you should follow it up with your hot fudge (that recipe really looks amazing!) but you might be too full. Maybe on consecutive days?! This is such a unique burger! I've seen stuffed burgers before but never doubled with pork. Definitely saving this one! Thanks for sharing at Inspiration Thursday. Have a great week! I hope you love it! Thanks for hosting! Interesting and fun way to serve hamburgers, taking it to the next level. Thanks! 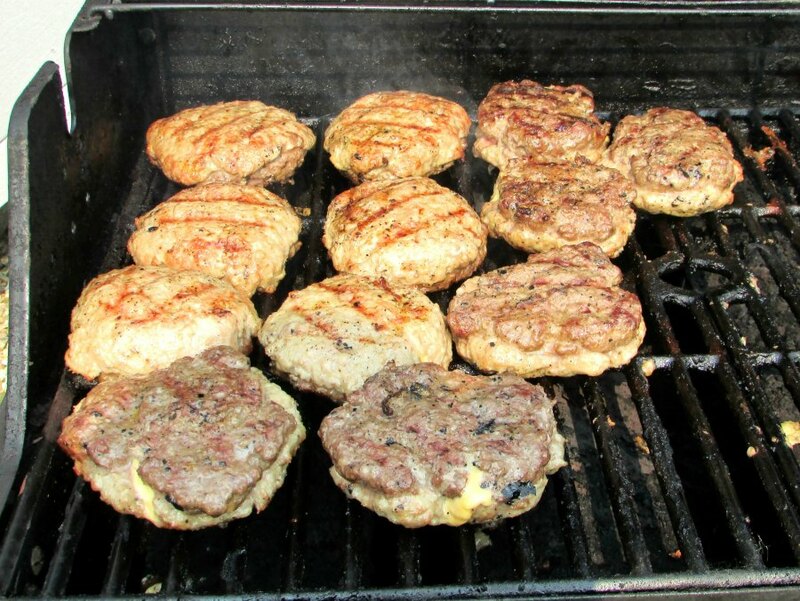 We really enjoy stuffing our burgers and the half pork, half beef was fun to try too! Thank you! We love trying new things and these were a hit! I am not a huge burger fan anymore... But I have to make this. I hope this brings you over to team burger! These look fabulous! My husband would absolutely love these. I'm sure he will! I hope you give them a try! 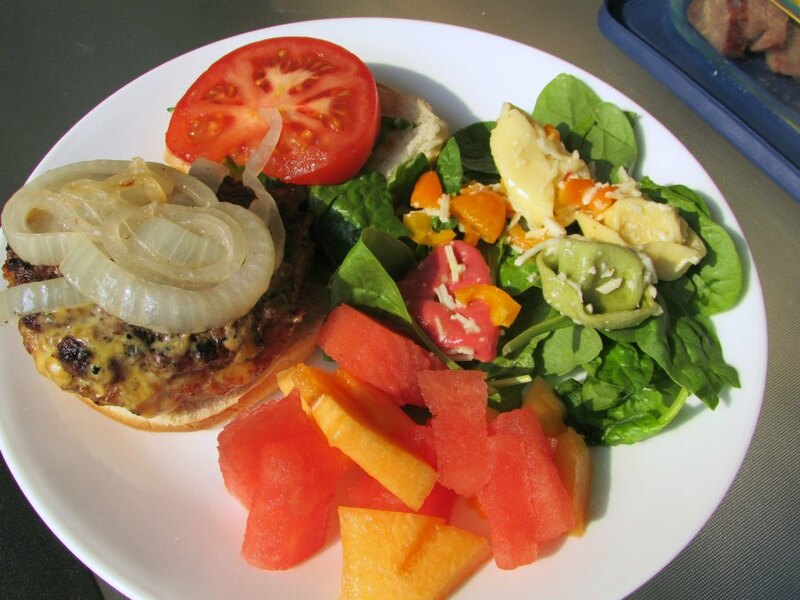 This looks good and it looks like it would be good for a Memorial Day burger. It certainly would be great for Memorial Day, thank you! Pinned for later. Looks delicious! This looks delicious! I don't eat pork but my hubby will love this recipe. Thanks for sharing! You could certainly use all beef too, but the two meat patty is a lot of fun! Yum! I always love different meat combos for burgers because I think it does make them much more flavorful and interesting. This looks great! Thank you! I love the contrast in flavor and texture too! Definitely to put these on the husbands list for grilling! They are a must make! Thanks! I definitely do need to put that on my bucket list! Thanks, Val!